So much RED.... I'm putting him away for the night and start on this little guy on a new day. Just thought I'd share. No doubt there! I start, work a thought, share my starting place and then work forwards and backward many times. This is going be one of those pics. Good practice though, Lynn. Thank you for sharing this little guy. Tricky is right! Looking good so far. Good luck Candy. Candy, is there a little lock of hair above his left ear right next to his head? There might be, Hannie. I'll be running through my second check tonight. I'll take a close look. Last night I worked primarily on the britches, shirt, and tried to get his leg back. Lastly, I worked on the background. Now, I'm puzzled what I should do with his shoes. Looking really good Candy. Maybe copy the front leg, flip horizontal and place it over the back leg. 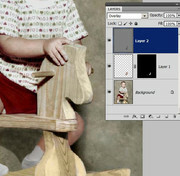 Mask the layer and then with reduced opacity paint in the lighter leg to give the back leg a bit of texture. You can add back some shadow too. Good tip shadow.. Candy do you think maybe blur the shoes a tad.. they caught my eye straight away as being a bit sharp.. see what you think.. I think both are great tips. Thanks girls!! Shoe blurred a bit more and knee lightened. And a few other little things. Last changes made and I'm sending him home! This was a tricky one and you whipped it right into shape Candy. Beautiful.